Well-used is the way that Karen Schuster (Class of 2008) described this cabbage palm (Sabal palmetto) that she photographed on our walk on the stout boardwalk at Spoonbill Marsh on 11/7/15. 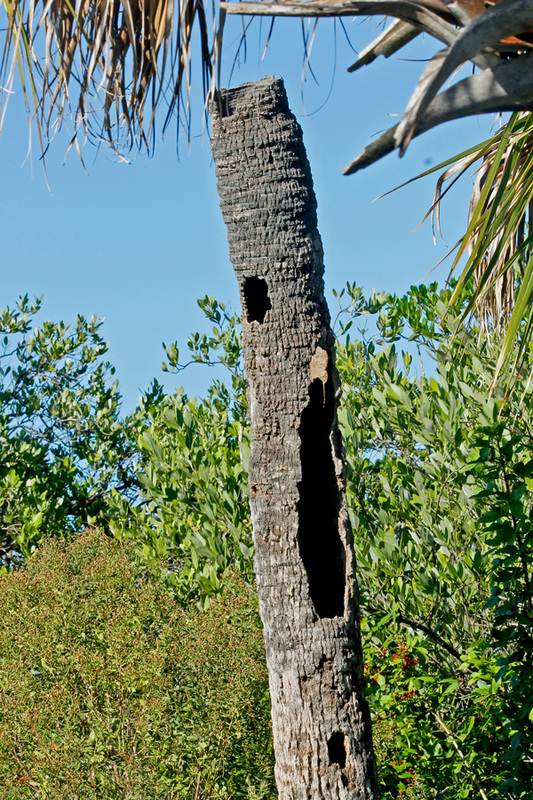 Woodpeckers are likely among the critters that have called this palm trunk home. 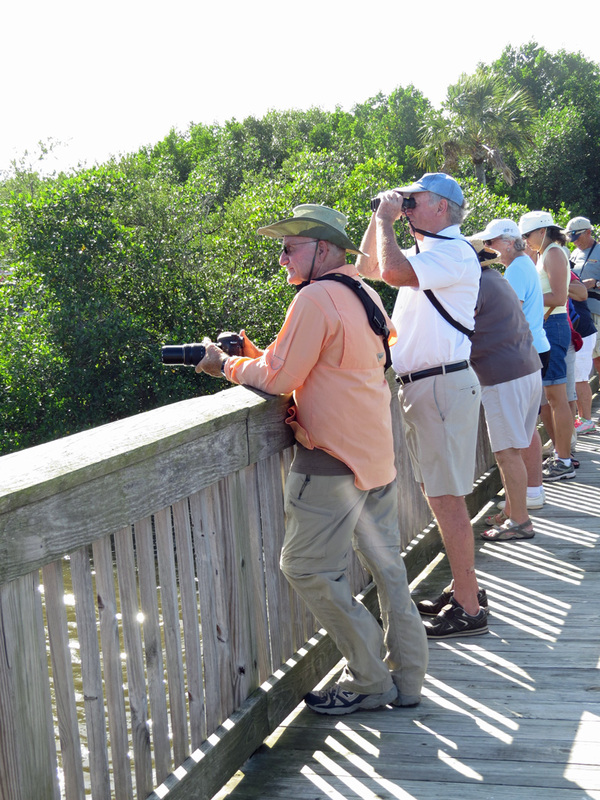 Bob Montanaro, Pelican Island Audubon Society Office Manager, will talk about woodpeckers and other cavity nesting birds as part of the 2016 volunteer nature stewardship class on 1-30-2016 as part of Life in the Pits and Treetops. Most of Spoonbill Marsh is mangrove-fringed wetlands, and the view at the Indian River Lagoon at the end of the burly boardwalk is quite scenic, shown below with Don Schuster (Class of 2008) and Peter Sutherland (Class of 2001) looking south. To the north of this scenic overlook is a “spur” of boardwalk along a narrow spit of high ground. 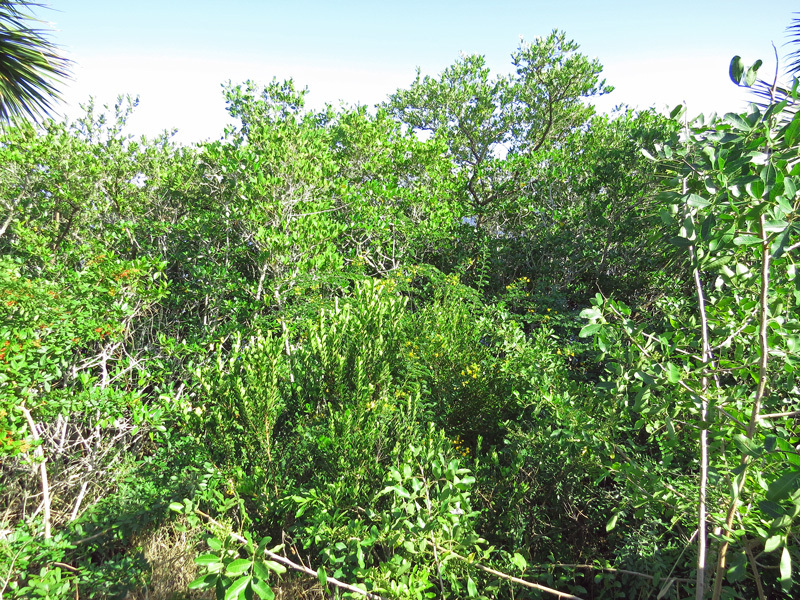 Nearest the Lagoon is a mosaic of mangroves, and on the relatively high ground grow saltbush, some hammock plants, and, unfortunately, some invading exotic pest plants. Look carefully and you will see the yellow flowers of that sly, seasonally-named invader, Christmas senna (Senna pendula), found for the first time at the Oslo Riverfront Conservation area during Winter of 2015 work days. 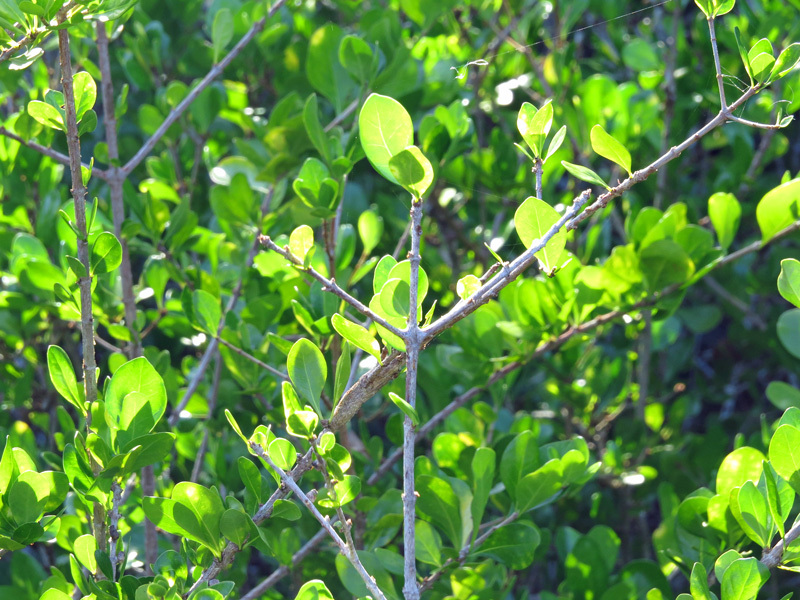 This plant was not present at Spoonbill Marsh on our last visit in late 2012 and now clambers over mangroves, a testimony of its ability to invade near wetlands as well as upland areas. This plant is still sold in the nursery trade and, unfortunately, was initially planted at (Pelican Island) Audubon House by the not-so-discerning landscape contractor. When we last visited Spoonbill Marsh, the Brazilian peppers (Schinus terebinthifolious) were tiny. Now they are larger than I am. 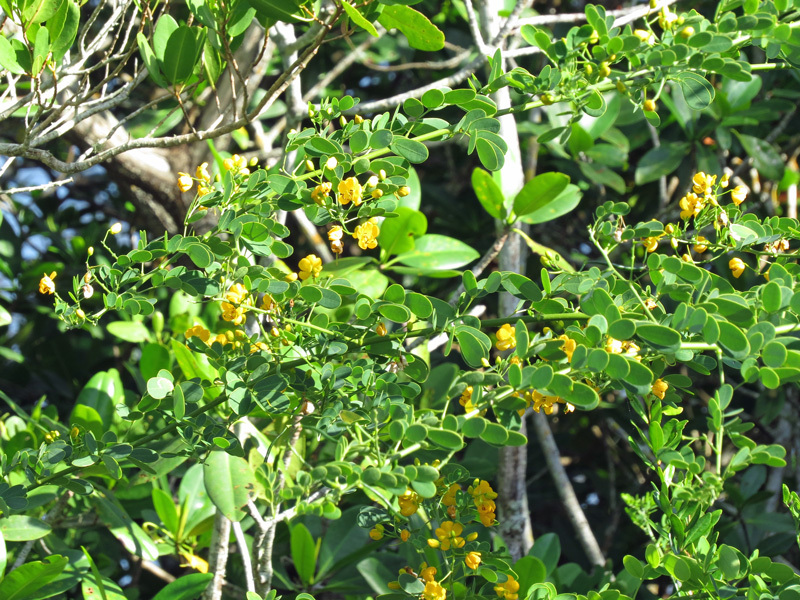 These 2 invasive pest plants outgrow the hammock natives that are trying hard to re-establish themselves, including another plant with a holiday connection. Nearby grows native white indigo berry (Randia aculeata) – with its distinctively angled branches. Get out your protractor, and you will find that nearly every branch emanates from the main trunk at about a 60 degree angle, which is ideal for hanging Christmas ornaments. Though not seasonally-named, this plant was used as a Christmas tree in Puerto Rico in days gone by.